Source: Col. Asbury Coward Marker, Kings Mountain National Military Park, Blacksburg (SC). Photo courtesy of Adam Domby. 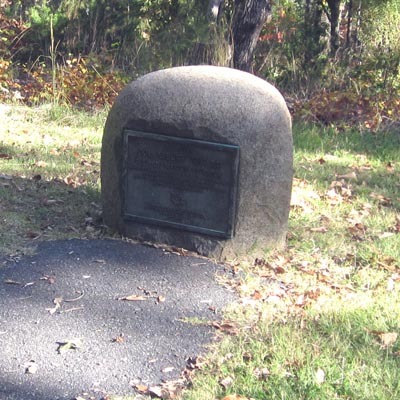 This marker is a two foot square uncut piece of granite with a bronze plaque affixed to the north face. The marker is slightly thumb-shaped, giving it the appearance of a small, natural boulder. The plaque bears an inscription to the memory of Colonel Asbury Coward, American patriot, and includes the insignia of the North Carolina Society of the Daughters of the American Revolution, the marker's sponsor. Colonel Asbury Coward was elected president of the King's Mountain Centennial Association, organized on July 25, 1879 at Kings mountain, North Carolina for the purpose of planning a celebration for the 100th anniversary of the Battle at Kings Mountain in 1880. Coward was born in Charleston, South Carolina in 1835 and served in the Confederate Army during the Civil War. In 1855, along with Micah Jenkins he founded the King's Mountain Military School in Yorksville, a preparatory school for the Citadel. The marker commemorates Coward for his central role in the activities of the Centennial Association and the raising of the Kings Mountain Centennial Monument for the centennial event on October 7, 1880. The marker is located east of the Kings Mountain Centennial Monument and south of the asphalt walking trail. The marker sits in a clearing at the end of a paved path. The clearing is surrounded by the heavily forested terrain of the park.